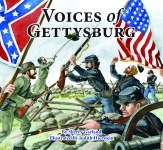 The second half of the book takes us to the gathering place of the Army of the Potomac, where Joshua Lawrence Chamberlain surveys the long valley below him, musing about the advantage of his position. Gen. George Meade stockpiles his determination to beat Lee, while Maj. Gen. Winfield Hancock ponders mortality before writing a letter to his wife. A Gettysburg citizen named Jennie Wade bakes and sings, seemingly safe from the raging battle, until pierced by a bullet through her kitchen window as another young woman prays for Jeb Stuart, who showed her kindness while riding past her with his cavalry the day before. 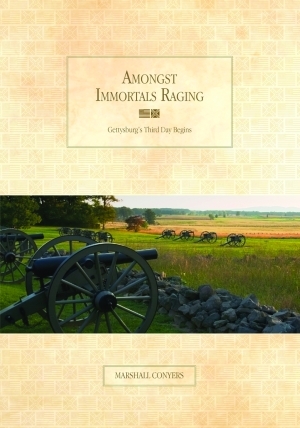 Surgeon William Watson shares his rage about the mayhem as infantryman Jake Applewhite sadly reflects that he is about to fight against his own kin—and later watches his younger brother die at the hands of a Union soldier. This story encompasses all the raging emotions of war, taking readers through a startling range of characters and perceptions, bringing us closer to the truth than nonfiction might. Marshall Conyers wrote this volume of poetry because he wanted readers to be privy to the thoughts of the brave men engaged in this historical attack. Author of the children’s book How Many Feathers Does It Take to Make an Eagle Fly?, he lives in North Carolina.